After a little more than a year on the sidelines, I’m pleased to share that McNee Associates will be much more active on a go-forward basis now that we’ve turned the corner into 2019 – as I am now beyond any constraints in regard to non-competes. I’m especially excited about re-engaging with friends and colleagues throughout our industry, as we are in the midst of so many important disruptive trends and emerging technologies, many of which are driving fantastic business innovation. In addition to continuing to publish the blog (see topics / themes below), I’m delighted to share that McNee Associates will be providing a range of consulting services for clients. For technology providers, this will focus primarily around Market Strategy and Go-to-Market consulting services, as well as custom research programs that support both internal planning and strategy development, as well as external thought-leadership that can be used to drive business development / awareness with senior business and IT execs. For technology buyers, this will focus primarily around leadership workshops and technology strategy development. I am excited about participating in a number of industry conferences, events and analyst briefings this year, across the target segments that I’ll be covering. First up is Salesforce’s Analyst Summit late next week in San Fran, to be followed by a number of additional events this Spring. If you are a provider who would like to invite me to your annual conference, or Analyst Summit – just reach out via email or phone (listed on Contact Us), or via LinkedIn. As noted, I’ll be ramping up my blogging, with a plan to publish a couple of times per month, although we may invite some guest bloggers as well. My blogging will primarily focus on the continued evolution of enterprise applications and infrastructure, and how enterprise data is increasingly becoming a key weapon framing business strategy. This includes the range of emerging analytic tools and technologies that are reshaping how we engage with customers, plan and target new offerings, optimize operations as well as develop new monetization strategies. I very much look forward to the adventures ahead, and encourage everyone who visits the website to subscribe to the blog, and to join me in the coming weeks and months ahead as we explore the future of Business IT! I am an optimist; always have been. That is why I find all of the growing anxiety around the advance of technology so fascinating. 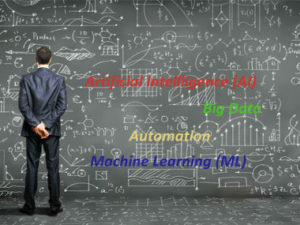 No doubt, the triad of Artificial Intelligence (AI), automation and big data are driving profound changes in business (and society) given their bottom-line impacts. What I don’t fully understand is the growing hysteria – often led by responsible business and scientific leaders – that suggest that AI and automation may led to WWIII (Elon Musk) and / or massive and growing economic discontinuities / inequalities (Stephen Hawking at the recent World Economic Forum). Yes, automation and AI will cause major economic dislocations, and forever change the employment landscape. Change is hard. Yet when has business and society been static? The range of transformative technological and scientific improvements over the past 150 years has been staggering – regularly impacting markets profoundly, and often over a very short period of time (e.g., advent of electricity). The only issue today is that the pace of change has accelerated, and the technologies that are transforming business and society now are being applied to cognitive problems that previously were believed to be the endeavor of humans. Frankly, in my opinion, we are only in the early stages of the economic and employment disruptions / discontinuities that are likely to occur. And while change is hard, change is usually good. Almost three-quarters of CIOs surveyed (72%) are leading digitization efforts, and more than half (53%) say [AI and] machine learning is a [strategic] focus. Nearly 90% say greater automation will increase the accuracy and speed of decisions. Over two-thirds (69%) of CIOs say decisions made by machines will be more accurate than those made by humans. CIOs who are at the forefront of adopting machine learning recognize the need for process and talent changes, but many cite challenges – including the need to redefine job descriptions to focus on work with intelligent machines, and hire employees with new skill sets. Data quality (51%) and outdated processes (48%) are substantial barriers to adoption. Lack of skills to manage smart machines is cited by 41% of CIOs, and lack of budget for [the acquisition of the] new skills is cited as a challenge by 47% of those surveyed. A select group of CIOs, whom ServiceNow and Oxford Economics call “first movers,” is outpacing their peers in their use of machine learning. Roughly 80% have developed methods to monitor machine-made mistakes vs. 41% of others. 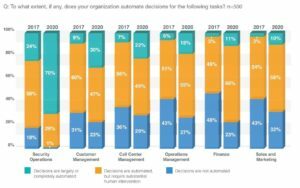 Half of them say automating routine processes will be key to their business’s success compared with 33% of others; more than three-quarters have redefined job descriptions to focus on work with machines, compared with 35% of others. Almost 90% of first movers expect decision automation to support topline growth vs. 67% of others. I found the following chart from the ServiceNow report especially revealing, as it reconfirms in my mind the fact that automation and AI / ML are mostly supportive technologies in the decision-making process, and that except for the automation of truly low-skill repetitive tasks, they will only enhance, not replace, most decision making and job roles. “the principle that human populations grow exponentially (i.e., doubling with each cycle) while food production grows at an arithmetic rate (i.e., by the repeated addition of a uniform increment in each uniform interval of time). Thus, while food output was likely to increase in a series of twenty-five year intervals in the arithmetic progression 1, 2, 3, 4, 5, 6, 7, 8, 9, and so on, population was capable of increasing in the geometric progression 1, 2, 4, 8, 16, 32, 64, 128, 256, and so forth. This scenario of arithmetic food growth with simultaneous geometric human population growth predicted a future when humans would have no resources to survive on” (quoted from the AAG Center for Global Geography Education). Little understood by Malthus and his contemporaries at the time were the incredible productivity gains brought about by the 2nd Agricultural Revolution of the late 18th and early 19th centuries, that paralleled the advance of capitalism and the Industrial Revolution. More recently, agricultural yields have skyrocketed based on modern biotechnology and advanced digital technologies – with governments throughout the world often paying farmers not to farm so as to manage yields and maintain pricing stability. So I remain an optimist – as today we don’t even know the new innovations and markets that will be created, at the same time that some jobs will be destroyed. Capital for labor substitution isn’t new – especially when it unleashes profoundly new and better outcomes, and innovative forces. This is what Joseph Schumpeter’s (1942) model of “creative destruction” is all about. What the current trends clearly indicate, however, is the tremendous need for labor market retraining investments, especially to help those caught with yesteryear skills become more relevant in our emerging knowledge-based and service-oriented economy. And I am not just talking about one-off retraining programs, but a long-term commitment to continuous training. This includes structural changes to the US economy and our educational system that helps foster technical skills [up and down the job ladder] that helps create talent suitable for the 21st century. Other countries, most notably Germany and France, do a much better job in these regards. Let’s learn from our long-time partners about dual-track vocational programs, and other important initiatives that are working. As I regularly tell my daughters, becoming a lifetime learner is not only fun, it will be critically important to their success and happiness. Please join me in being an optimist. We live in an amazing time, and the future is ours. If you are not already subscribed to my blog, I encourage you to do so. Next week I’ll provide highlights from my trip to New York City and the IBM Cloud Analyst Summit that I’ll be attending. As previously noted, my plan is to publish a blog post roughly once a week, so I won’t overwhelm your inbox! 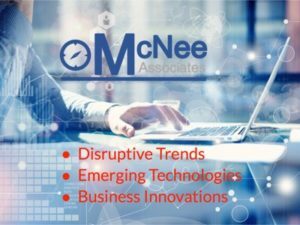 I am delighted to announce that McNee Associates officially launched earlier today – a new blog platform I will use to explore the key trends and technologies that are driving business innovation, and related topics. I’ve been tracking emerging and disruptive technologies that are transforming business and society for more than 30 years, starting in the mid-80s (when I worked in finance and strategic planning roles at CBS and HBO), through more than a dozen years at Gartner as a research analyst / executive, and more recently at Saugatuck Technology and ISG. At this point it’s firmly rooted in my blood, and I look forward to the evolving journey! 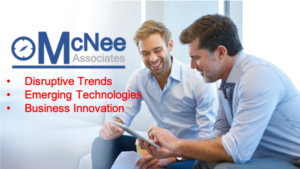 McNee Associate’s mission is pretty simple – to provide a platform to help senior business and IT leaders think clearly and deeply about the future, so as to be better prepared to develop and execute winning technology-enabled business strategies. The goal of the blog is to cut through the jargon and the buzzwords, delivering original insight and analysis around the key market shifts that are occurring, and the players who are making it happen. In my experience, consistently questioning commonly held assumptions is key to creating new awareness, which is fundamental to developing and honing winning strategies and tactics. As has been my research philosophy for many years, the blog will include first-person research I’ll conduct with early adopters – both summary insights as well as extended interviews – who often share important lessons learned and the key challenges to be overcome, as well as regular engagement with leading and emerging technology providers to stay abreast of changing market dynamics. I look forward to actively engaging with our network of seasoned business and IT leaders, as well as meeting all of the interesting entrepreneurs and industry leaders that are leveraging a range of disruptive technologies transforming business and society. Where appropriate the blog will leverage 3rd party surveys (when credible), and over time we may develop and publish our own forward-looking surveys as the blog evolves. I’ll be the primary author of this blog, although I may occasionally invite guest bloggers to join in the debate. Further, I want to welcome all of our readers to be a part of our journey, so please reach out with your thoughts and feedback, to help make the blog better and more useful. I very much look forward to the journey ahead, and encourage everyone who visits the website to subscribe to the blog, and to join me in the coming weeks and months ahead as we explore the future of Business IT! My plan is to publish a blog post roughly once a week, so I won’t overwhelm your inbox!